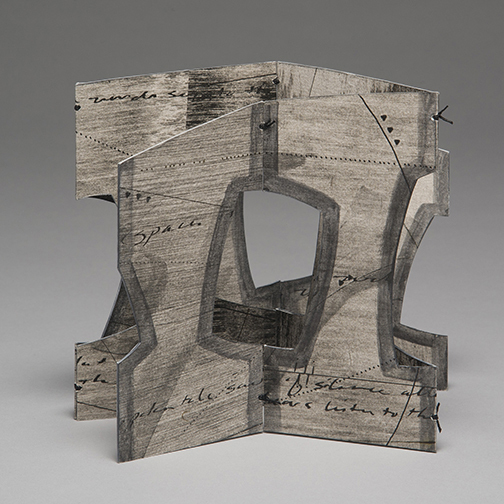 For years I have been making books and objects that combine layers of text, image and surface design. While my work is highly craft-centered and material-centric, it is the ideas and concepts that always drive the process and guide the media used. Vastness of Silence is from an ongoing series called Listen. The overall theme is acknowledging and honoring the spaces or pauses encircling the words in verbal conversations. Just as musical rests are important to give the notes their full meaning, the silences surrounding the words give voice to the full meaning in and throughout conversations. This book was designed so that the three apertures would line up as the accordion folds are reversed, allowing for a view through all three openings. The voids represent the pauses or gaps in discussions. The wire-edge binding technique was used because the structure needed to be completely flexible and the joints needed to be mechanically sound. The stiffness of the laminated leaves permitted the book to be displayed standing up. It became apparent as the piece was created that the book had multiple configurations that were just as interesting as the first conception. I leave it to others to arrange the book in ways that please them. The imagery is intaglio printing with paste paint, pochoir and hand lettering added to the base layer. The resulting pattern of ambiguous text and with intentional structure creates an interactive experience for the viewer, regardless if the book is handheld or on display.